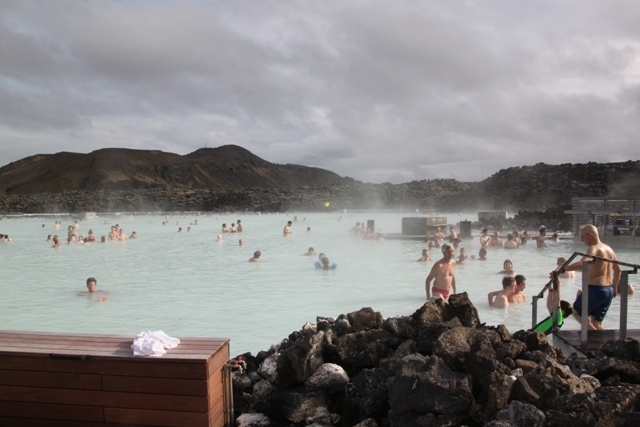 The Blue Lagoon – the most famous geothermal spa in Iceland and possibly the most touristy thing to do in the whole of the country. Every tourist seems to go there, every piece of literature talks about it, all the tour buses call here (some even on their way to and from the airport) and I really didn’t want to go. Apart from anything else, my idea of a fun day out does not involve getting undressed and sitting in an outdoor hot bath, in subzero temperatures with hundreds of other people. However, democracy rules in our house, the other 2 in the family over-ruled me and we set off. 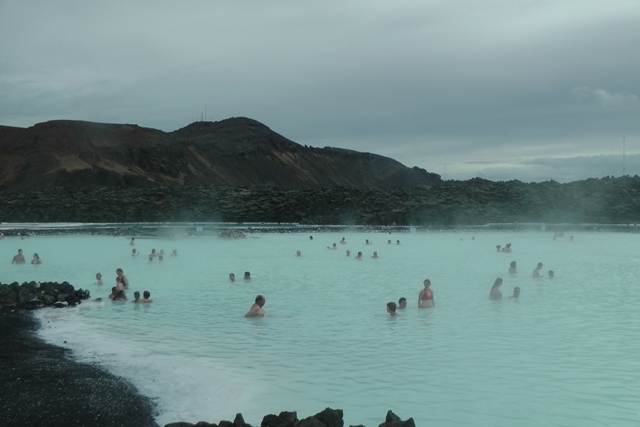 It takes about 40 minutes to drive to the Blue Lagoon from Reykjavik. It is literally in the middle of nowhere. As we got closer, a cold day turned even colder when a huge black cloud settled overhead, you could feel the icy air and it started to pour with rain. The 9 year old started to pipe up from the back seat that he didn’t really fancy the Blue Lagoon in this weather – now he tells me. My initial reluctance was growing stronger by the second. So, we put if off for a while. We found a little town nearby, struggled for about half an hour to find a coffee shop and had to settle for a grimy garage. We bought coffee, ice cream and waited. Incidentally the coffee was great and the 9 year old declared the ice-cream with chocolate sauce and mega sprinkles was “Epic.” Just goes to show – don’t judge the book by its cover. The rain passed, it was time to make a decision. Again I was over-ruled. Blue Lagoon we were on our way. The car park was packed – stacks of tour buses and so many people. This was not looking good. I did have to concede – the setting is pretty spectacular. 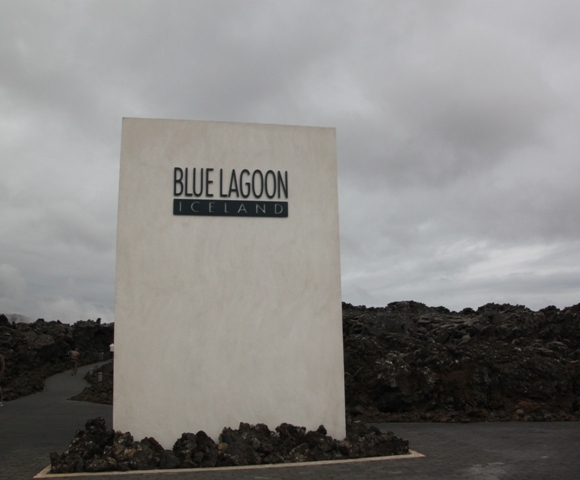 It is set in the middle of lava fields – black boulders and black sand as far as the eye can see, the only evidence of the lagoon is the steam rising up into the air. We paid to go inside – there are all sorts of different packages, we chose the no-frills, entry only package – still not cheap. Husband had forgotten to pack his swimming shorts so had to buy a pair here. Fortunately they were not too naff (concern no.1), not too skimpy (concern no. 2) and not too expensive (concern no. 3). 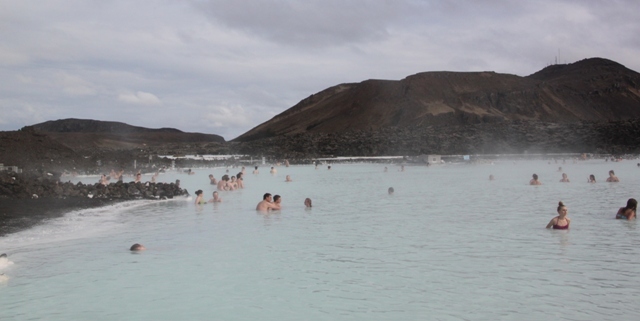 The Blue Lagoon is big – 5,000 square metres to be precise. I thought it was a natural phenomenon – not so. It is a by-product of the nearby power plant. They use natural hot water there to heat spring water, this produces central heating for the houses in the city. 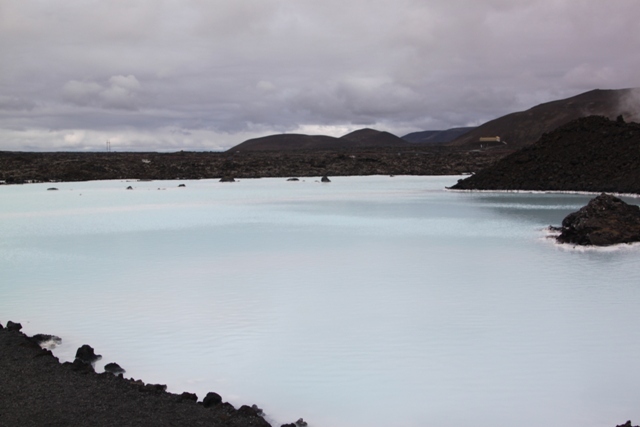 The excess sea water is then pumped into the Blue Lagoon. Husband and the 9 year old scooted off to the men’s changing rooms. I gingerly entered the ladies – after a lot of time trying to figure out the high-tech lockers and bracelets, I eventually sussed things out. (I needed the 9 year old – he sorted husband in seconds). Next challenge was the changing rooms – what an experience (and not a good one). Ladies of all sizes, shapes, ages and skin types walking around, chatting and doing their thing and all completely naked. It was an eye-opener, not an experience I would like to repeat. Who knew the effects of gravity could be so extreme. I cowered in the corner, stayed behind my towel and jumped into my swimming costume as quickly as possible. Next came the showers. Before you get into the lagoon you have to shower with soap. They rely on the natural minerals in the water for hygiene, they don’t use chlorine. So, the shower area had more ladies of all shapes and sizes, gleefully whipping off their costumes and whipping out the soap, lathering themselves under the showers. I managed to find one solitary cubicle with a door and pounced on that. Husband and the 9 year old were waiting when I emerged, shaken but still hanging in there – we went outside, felt slapped by the burst of cold air, raced to the hangers, left our towels and got into the water as fast as it was earthly possible. Then things changed for me… sheer bliss, absolute heaven and I loved it. The water temperature was about 40 degrees, you sank into it and it felt so wonderful. This is why people come here in droves – it is marvellous. The walls of the lagoon are silky smooth. Your toes sink into the soft sediment on the bottom and you relax into the milky blue water. We just lounged around, loving it. Around the edges they have boxes of silica mud. You can lather this on your face – apparently it’s good for the skin – it is a nightmare to wash off. The water is seriously salty – about the same as the Mediterranean. 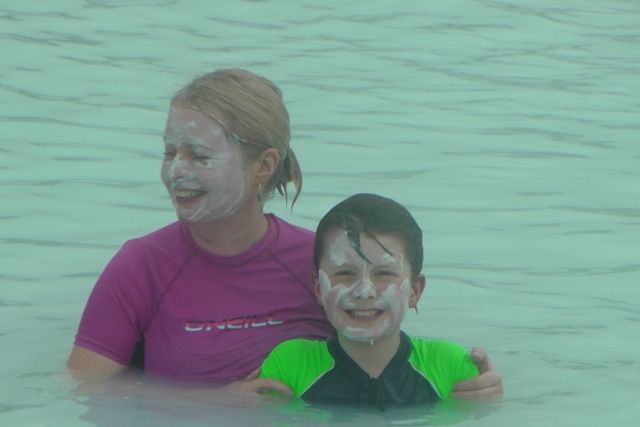 The 9 year old loved floating around – so easy in the salty seawater. Apparently the water is really good for your skin with all the naturally occurring salts and minerals. Can’t say I noticed really. It is definitely not good for your hair – the 9 year old did not wash his properly at the end and ended up with a matted wig like effect. They have a bar right in the middle of the lagoon. The high tech locker bracelet keeps track of all your purchases, so you don’t have to worry about money. You just scan the bracelet when you leave and settle your bill. We did not go down that route, fear of getting carried away and Icelandic drinks prices put paid to that. We actually stayed here for about 2 hours. You have to keep getting in and out of the water. 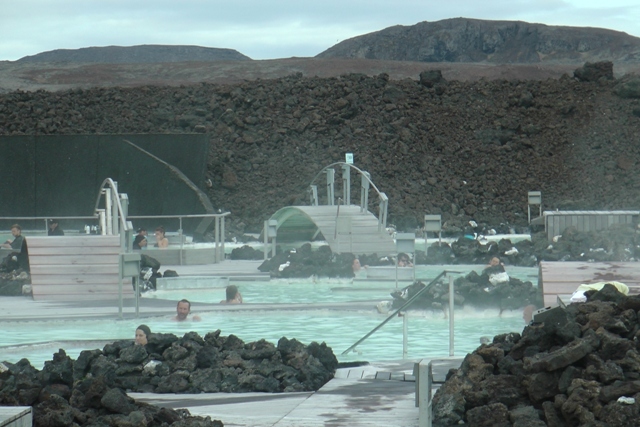 They recommend regular breaks, as amazingly, the water can start to feel too hot. This is when the icy air comes into its own – so refreshing and perfect for cooling you down. You just stand up and let nature do its work. 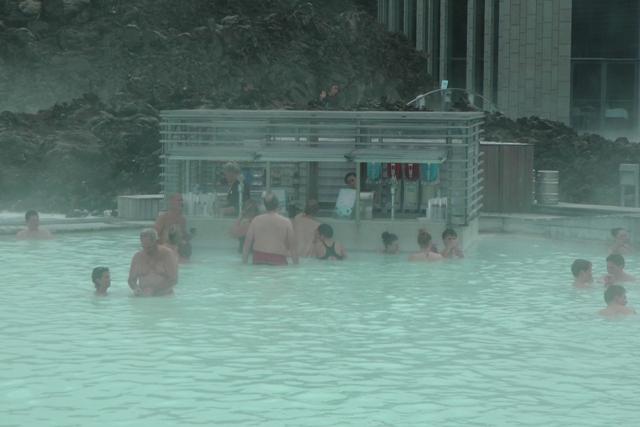 So my advice is do not be put off by the tourist trap that is the Blue Lagoon. 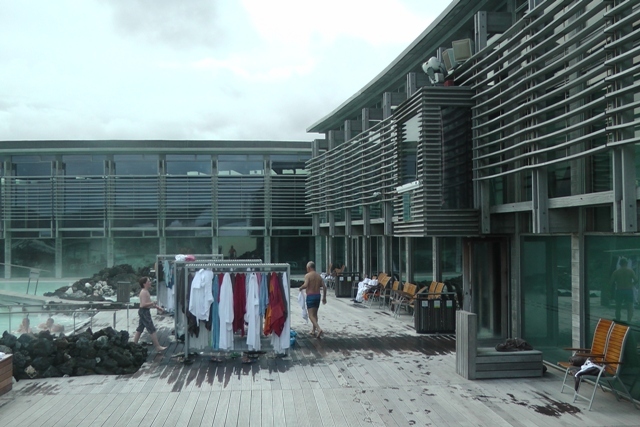 It is expensive, an out and out tourist trap and don’t even start me on the changing rooms and communal showers….. What it is though, the most wonderful experience, a beautiful place and something you cannot visit Iceland and not do. I totally recommend it. I (unexpectedly and reluctantly) liked it! Try it if you get the chance, it might surprise you too. We were like you…very unsure, but ended up absolutely loving it. We took a tour bus to get there and wondered how we would fill the four hours we had there. If flew by, including getting some dinner. Your story is so similar to ours that reading it was like reliving our own adventure. It’s strange isn’t it – I thought I would hate it, ended up loving it and would definitely go back, it is such a stunning and unusual place. I would love to see this someday! It is worth seeing – absolutely wonderful day out! If you ever get the chance, definitely take it! It is a really unforgettable experience, we all loved it. Great article! 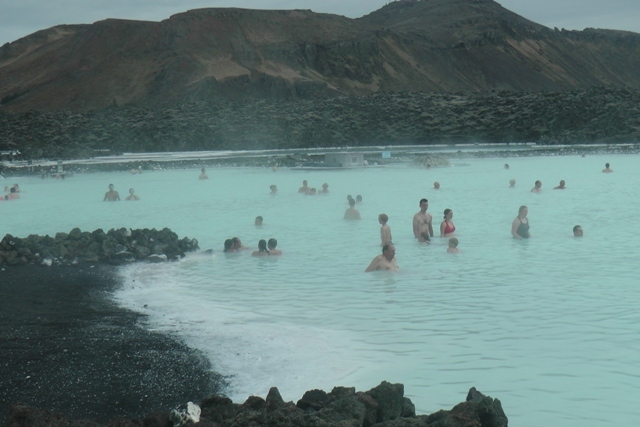 I had just share your articles about The Blue Lagoon on my travel site, I hope you don’t mind. This is a website that let bloggers or travel to share some great articles or photos about travel, and indexed by attractions.